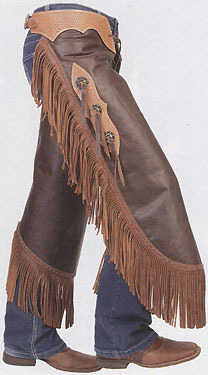 Weaver Leather Chaps - work, chinks, equitation, and half chaps. Weaver manufactures a wide variety of high quality leather and nylon tack. These chaps are part of their large selections of ranching & horseback riding equipment. Very much a production company, economies of scale, and great equipment and great workers make them priced right for above standard products you will enjoy. Weaver Western chaps are made for function. They adjust simply, fit well on most all people and are easy to care for. Quality is important to you, and quality is important to Weaver. Cultured Cowboy is proud to be one of their distributors. Delivery is reasonable from the time you order. Mostly, Weaver uses assorted browns for their working cowboy chaps. The weights are appropriate for your needs. 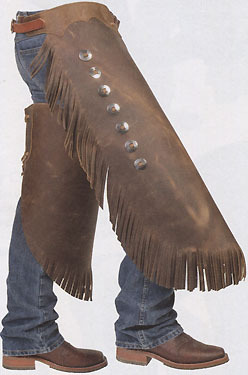 When you need a good basic chap, keep Weaver leather chaps and Weaver leather chinks in mind. Weaver Brown Top Grain Leather Chinks - Now made with improved supple, top grain leather. Crafted from full grain comfortable leather by top craftsmen. Traditionally styled chinks are short for added freedom in movement. Legging attaches with adjustable straps held by decorative conchos. Fringed. Buckle closure in rear. Front ties with leather thong. Similar to, but slightly fuller cut thigh than the 65-3270 you might already have. Waist 27" - 32" 32" - 38" 36" - 42" 41" - 47"
Total Length 32" 34" 36" 36"
In a great selection of Working Chinks and Western Fashion Chink styles, these leathers perform! Weaver buys quantities of consistent and the same leathers, rather than the assorted packages other chap makers might use. The volume is good enough that they can maintain their low costs with these quantities. Although production based, the higher end chinks here are certainly not ordinary! When in doubt about sizing...fit your upper thigh. I see a lot of people pulling on chinks with the front side very close. It is usually a little better if you widen that front area more. Chinks & chaps are not supposed to "zip" close in front. I was asked about whether a tooled leather or a traditional extra layer of chap leather was best for belting chinks. It is really a matter of comfort for you. IF you want a softer feel and easy to bend with you sort of belt, get ones with the legging leather waist reinforcement. If you need a little more sturdy in your step, then we consider a waist made with belt leather. On either, Weaver uses a belt leather to adjust the very back, because the legging leather has a tendency to stretch the holes with the buckle. 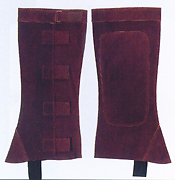 Other makers might lace in their rear, which like rodeo type chaps, avoids the issue of stretching out the holes. Because chinks are, with some ranchers, put on & off during the day, Weaver makes it easy to do with a standard buckle at the rear. Weaver decided to maintain the traditional tie strap in the front. If you prefer a front belt & buckle, We can have this don for you with Saddle Barn Chinks, or Cultured Cowboy can rework these to have a belt front. Let us know! Weaver Oiled Pull- up Leather Work Chinks - Handcrafted from Chrome Tanned pull-up leather for a well worn, broken in look and heavy duty performance. This one is made for the workin cowboy. Laced stainless steel conchos adorn each leg. Top left concho features a "Get-Down" ring for the attachment of your strings. Legging attaches with adjustable straps. Fringed. Buckle closure in rear. Front ties with leather thong. Slightly fuller cut thigh. Weaver Distressed Brown Grain Leather Chinks with Basketweave Yoke set - Now made with improved supple, top grain leather. Crafted from comfortable chrome tanned distressed leather by top craftsmen. Traditionally styled chinks are shorter than a work chap, for added freedom in movement. Legging attaches with adjustable straps held by decorative stainless steel conchos. Fringed. Buckle closure in rear. Front ties with leather thong. Thigh patch and belt are of basket stamped tool belt leather. Weaver Doetan Leather Chinks with Skirting Leather Yoke set - This is a more high end leather. Good all purpose chink that will NOT stay this color as you work! No, boys, yellow is not sissy. Ya buy these because they feel good. 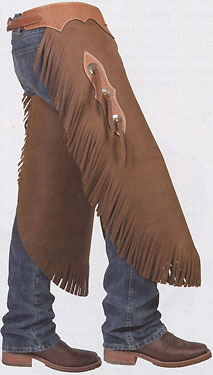 (I'm pretty sure doetan is a Weaver name for soft tanned cowhide or else they would just say deerskin. Similar to Nocona Boots' Deer-Tanned Cowhide, but thick for a chink, not thinner like a boot leather. Problem with most deer is: thin and tears too easy. Elk gives you more body.) These will work for you. Chestnut color skirting leather belt & thigh patch. Yep, they put floral conchos on this one. Who says, "Guys can't look pretty too?" ( reality is that this is a sturdy Jeremiah Watt stainless concho group, used on saddles & stuff.) Legging attaches with adjustable straps. Fringed. Buckle closure in rear. Front ties with leather thong. 65-3298 Weaver Pull-Up "Fashion" Leather Chinks - Well, they call 'em fashion just because they look better than average. This is a sweet looking pair of chaps that will still take the rigors of your duties. Now made with improved supple, top grain leather. Crafted leggings from full grain, comfortable, chrome tanned pull up leather, by top craftsmen. A little more than traditional, these chinks are shorter than a work chap for added freedom in movement. Notice the rich golden tones of this leather! Legging attaches with adjustable straps held by decorative conchos. Conchos are floral engraved with black accents from Jeremiah Watt. 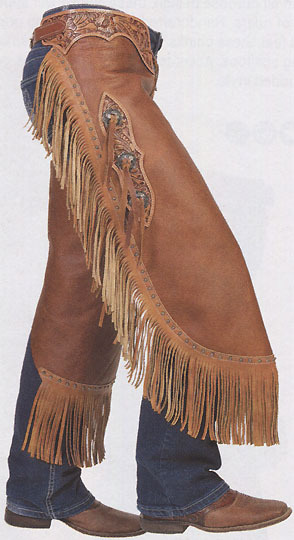 Fringed leather is also accented with a nice flair. Floral Tooling packs the leather belt giving more support than a belt made with another layer of the same legging leather. If you want a little more "feel and support", this chink gives it to you. Buckle closure in rear. Front ties with leather thong. Similar to, but slightly fuller cut thigh than the traditional chink you might already have. 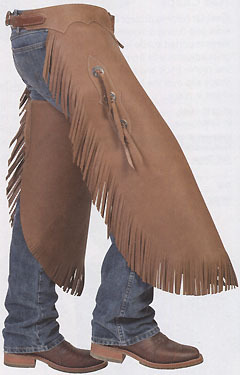 65-3299 Weaver Pull-Up "Fashion" Leather Chinks - Basket Stamps Belt Yoke & thigh patches. . This is a sweet looking pair of chaps that will still take the rigors of your duties. Now made with improved supple, top grain leather. Crafted leggings from chocolate full grain, comfortable, chrome tanned pull up leather. A little more than traditional, these chinks are shorter than a work chap for added freedom in movement. Notice the rich contrasting tones of this leather chink! Legging attaches with adjustable straps held by decorative conchos. Conchos are antique copper berry, as are the umbrella spots adorning the top line of the fringe. Sewn on Fringed leather is contrasted with a nice flair. Basket Tooling also packs the leather belt giving more support than a belt made with another layer of the same legging leather. If you want a little more "feel and support", this chink gives it to you. Buckle closure in rear. Front ties with leather thong. Similar to, but slightly fuller cut thigh than the traditional chink you might already have. One of our past biggest challenges is to get a work chap that has leather that lasts, but that you can still move. Now we can. 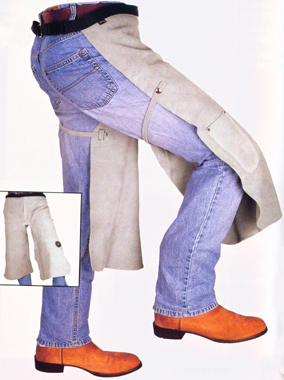 If you are new at chaps, look and see that the chap belt is below your jeans belt, but over the point of the buttocks. (or if yer wearin them low rise things, at least hug on top of the hips.) Chaps are not made to be so tight in your crotch that you can't sing deeper than soprano. There is a little room at the bottom to cut off if you need to. When in doubt about sizing...fit your upper thigh. Weaver Leather Shotgun Work Chaps - Now made with improved softer, more pliable leather. Choose oil tanned full grain (shown right) or split leather (below right). Durable and dependable performance. WEA 65-3275 is crafted from oil tanned leather by top craftsmen. Full zippers for protection. Buckle closure in rear. Front ties with leather thong. Weaver Leather Shotgun Work Chaps - Improved softer, more pliable leather. Brown split color. Split leather. Durable and dependable performance. Crafted from some of the best split leather by top craftsmen. Full zippers for protection. Buckle closure in rear. Front ties with leather thong. 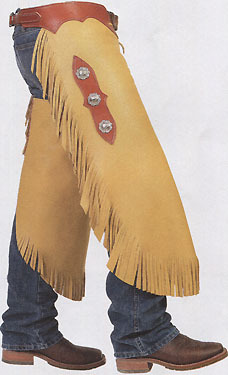 Waist 26" - 32" 32" - 38" 36" - 42" 40" - 46"
Total Length 41" 43" 45" 45"
The single concho rear allows you to grab those chaps and swing them to a "best fit" for show. You can see from the inset that these Weaver leather show chaps fit like they should. Partially because of the angle of the fringe. 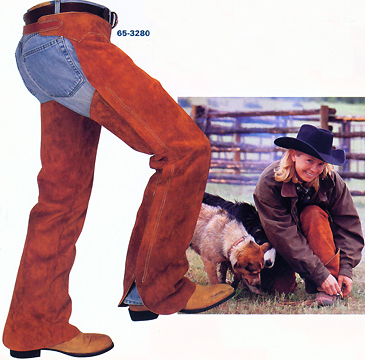 Partially because of that rear beltless concho. partially because of the special cut of the chap body. Show chaps need to look long. When you walk, roll the bottoms up. or take 'em off. Your importance is under saddle, in the saddle. 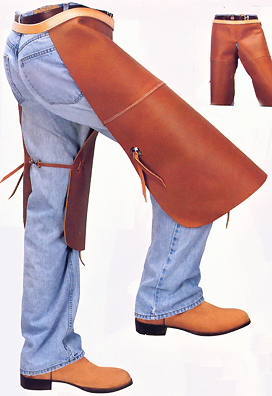 Weaver Leather Split Leather Equitation Chaps - Now made with improved softer, more pliable leather. Fringed across the fanny, all the way down your leg. Longer chap styling helps give a "heels down" look. Built by top craftsmen. Full zippers for protection. Concho closure in rear. Buckle keeper & tip set in front. Choose from black (shown right), sand, or brown. Waist 26" - 32" 28" - 34" 30" - 38" 34" - 40" 36" - 42"
Upper Thigh 21" 22" 24" 25" 26"
Mid Thigh 17" 18" 19" 20" 22"
Knee 15" 16" 16" 18" 19"
Calf 15" 16" 16" 18" 19"
Outseam 38" 39" 41" 43" 44"
When you want to wear a lower top boot or shoe, these will offer some lower leg protection. Some people just get a pair to wear through high grass in morning dew. Some people really use them to ride! This tool has gone beyond English kids needing a cheap alternative. Especially in the endurance world. 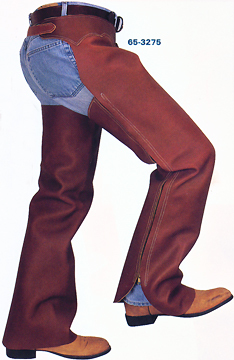 Suede Half Chaps offer a great fit from knee to ankle. Low profile Velcro closure allows fit and adjustability. 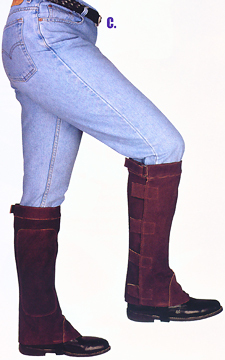 Elastic boot strap slips over instep to keep chaps in place. Reinforced inside leg. Imported in popular sizes. Choose your size XS, S, M, L, XL. Top Grain Hay Chaps are just long enough to throw those bales with your knee, but not so long as to be tripping while walking behind the truck! Snaps around your legs. offer a great fit from knee to ankle. Low profile Velcro closure allows fit and adjustability. One size fits all. Chrome split apron style farrier apron has a knife pocket on the right side. It has a Two Inch nail magnet on the left leg. (Mighty handy). Quick release plastic buckle for easy on and off. Waist fits 29" to 52" belly. Adjustable thigh straps snap. Looking for still different looks in Work Chinks and Chaps? Try this link too. Or call us for a custom pair.